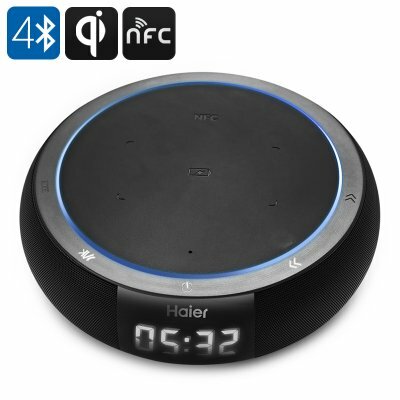 Successfully Added Haier Bluetooth Speaker - Bluetooth 4.0, 360 Degree Surround Audio, NFC, Qi-Enabled Wireless Charging to your Shopping Cart. With Haier’s new Bluetooth speaker you can play and enjoy all your favorite music straight from your Smartphone. Whether you are enjoying a casual evening at home and are in the mood of some fine tunes - or are having a housewarming party for all your friends - this Bluetooth speaker enables you to play your favorite tracks in stunning sound quality when ever you want. Its two large 5 Watt speakers deliver a stunning 360 degree surround experience and with a 2600mAh you can keep listening music non-stop up to three hours constantly when not connected to an external power source. By simply placing your Smartphone or any Qi-enabled device on top of this remarkable speaker it functions as a wireless power bank, allowing you to charge your phone while playing your favorite tracks. Thanks to its NFC feature the speaker automatically activates and connects to your Smartphone when placed near the device. No longer will there be a need to synchronize your phone and speaker by means of any cables. Bluetooth 4.0 connection furthermore allows you to be more mobile by achieving a convenient and long-distance transmission up to 10 meters, allowing you to control your speaker by simply selecting the track you want to listen from you Smartphone without the need to get up from you comfortable sofa. Its round and sleek design makes this Bluetooth speaker a stunning accessory that fits perfectly in any modern household. With this fine looking speaker your next party is guaranteed to be a success. The Haier Wireless Charging Smart Bluetooth Speaker comes with 12 months warranty. Brought to you by the leader in electronic devices as well as wholesale Bluetooth speaker, Chinavasion..